Best summation of Libertarian thought I have read. Would you listen to For a New Liberty again? Why? While I don't agree with 100% of the material, I do agree with almost all of it. 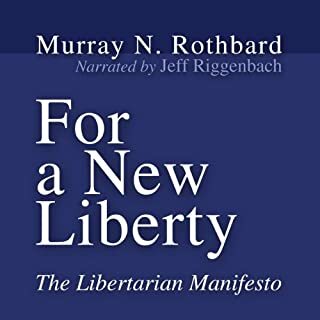 What I like most is the fluid way in which the author links all of the seemingly disparate subjects and underlies the libertarian argument with principal rather than prescription. Highly recommend if you are interested in something other than Right vs Left, Conservative vs Liberal, or Republican vs Democrat. Both political parties are just 2 breed of fox trying to raid the hen house...the end result is the same. They only differ (slightly) in their methods. What was one of the most memorable moments of For a New Liberty? The discussion of how property rights actually underscore most human and civil rights. A thorough grasp of this concept would fundamentally change almost any society. I do disagree with the author on the point of abortion. The author seems to have a made a logical jump in his presupposition, which seems preposterous if you spell it out, but the author does not address it. Actually, coverage of the subject is quite brief, which may be best as I didn't agree. Nonetheless, the author appears genuine in his reasoning and motivations.